The Metropolitan Nursery School was established in 1966 by Metropolitan Memorial United Methodist Church to serve its members and the community. It is the school’s philosophy that young children thrive best in a small family-oriented, nurturing environment. It is this philosophy and the continuity of a warm and caring faculty that gives the school its special style and flavor. The nursery school is as broad as life, and the interests of the child are many. 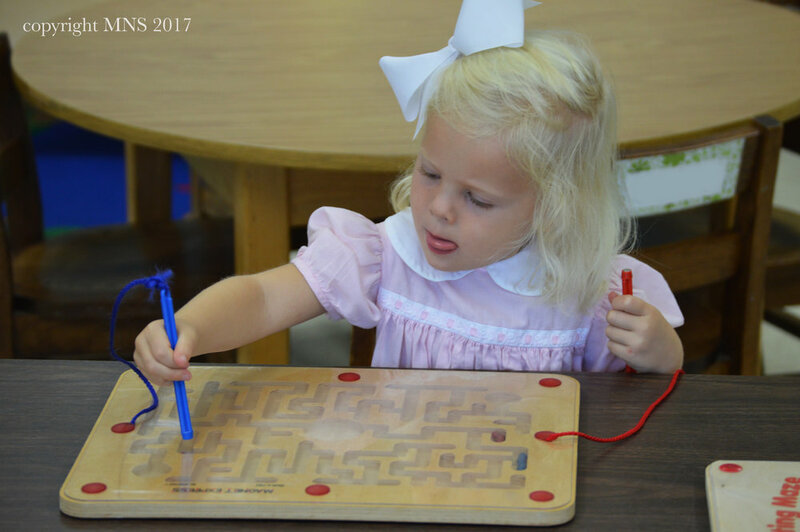 Children are encouraged to develop their own insights and skills through a variety of daily activities in the areas of language arts, literature, music, dramatic play, art, math, science and nature. The 2-year-old program is an unstructured program where children learn to play together, take turns and make friends. The morning schedule provides a balance of active, quiet, individual and small group activities. The 3- and 4-year programs provide a definite routine designed to develop good social and academic skills while still providing plenty of creative free time. When the children arrive they can choose from a variety of activities including puzzles, books, blocks, imaginative play or art. Each day they participate in circle time which allows the children to participate in singing, rhythm, conversation, games and stories. We recognize the importance of outdoor play to the children’s development. Each classroom plays on our convenient playground on a daily basis.